Vintage - Paragon Fine Bone China, A 20 Pieces set, Service for Five, Plus. In the "Michelle" Pattern, Circa 1957-1963. A "Michelle" Pattern Tea Set Produced by Paragon Fine Bone China of England. A Lovely Floral Pattern with Cobalt Blue Flowers, Tan Centers, Pink Leaves and Tan Stems. All Trim on the Pieces is 22kt Gold and can be found on Cup Feet, Handles and Rims. This is a really striking Tea Set from the 1950's, and is both Sophisticated and Casual. Missing 1-Tea Plate, but otherwise in great condition. Vintage - Paragon Fine Bone China, A 20 Piece Set, Service for Five, Plus. In the "Michelle" Pattern, Circa 1957-1963. 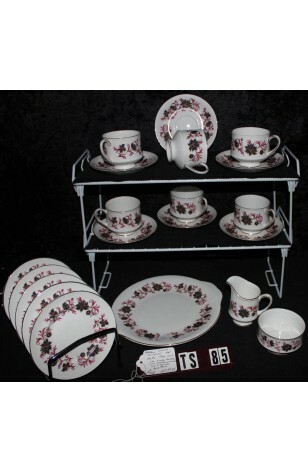 A "Michelle" Pattern Tea Set Produced by Paragon Fine Bone China of England. A Lovely Floral Pattern with Cobalt Blue Flowers, Tan Centers, Pink Leaves and Tan Stems. All Trim on the Pieces is 22kt Gold and can be found on Cup Feet, Handles and Rims. This is a really striking Tea Set from the 1950's, and is both Sophisticated and Casual. Missing 1-Tea Plate, but otherwise in Great Resale Condition unless noted below or in pictures. 6 - Saucers - 5 3/8"